The MPD Components team has designed and produced microwave circuit modules for military and commercial systems since the early 1960's. Over the last four decades, MPDC has produced hundreds of thousands of transmitter, receiver, transponder, oscillator, amplifier, power supply, and modulator assemblies for a broad spectrum of military and commercial systems. Our most valued marketing tool is our reputation for excellence. Prior to 1987, we were part of the Microwave Product Department (MPD) of General Electric. 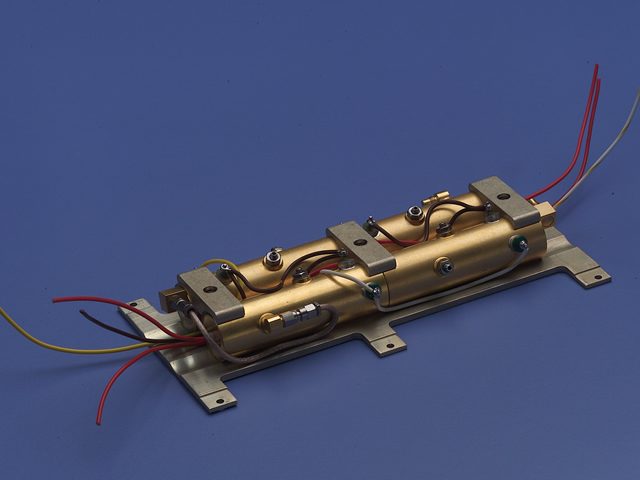 MPD manufactures solid state CW microwave transmitters which operate from 8-40 GHz and 5-200 mW. MPD also manufactures modules based upon our planar triodes that range from 1.030 - 6.0 GHz and powers from 25 mW CW to over 700 Watts pulsed. We make avionics cavities, DRO's, pulsed diode cavities, CW diode cavities, CW linear VTO's and avionics broadband pulsed amplifiers. We'd be happy to discuss your application. Our MCMs are at the heart of missile guidance systems. We're aboard the Patriot, AEGIS, Chaparral, Harpoon, Minuteman III, and MX Missile Systems. And in terms of military aircraft, there are only a few strategic, tactical, or non-combat aircraft that we're not aboard. We're also aboard a large number of private aircraft. NOTE: The documents published on this page are in Adobe's Acrobat portable document format (*.pdf). To view or print these documents you will need version 4.0 of Adobe's Acrobat Reader or higher.